Paint on the die contains excessive levels of lead. 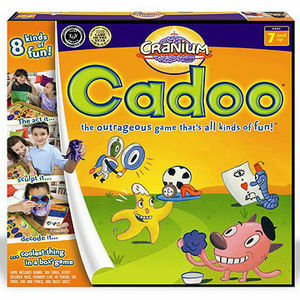 The recall involves about 38,000 Cranium Cadoo board games. Only the die found in Cranium Cadoo board games with lot numbers 2007195 through 2007244 are included in the recall. The game is packaged in a square cardboard box with an orange background. The seven-digit lot number is printed under the plastic tray on the bottom half of the box. Fred Meyer, Kmart, Shopko, Wal-Mart, and specialty game stores nationwide between October 2007 and January 2008 for about $20. Get rid of the die immediately and contact Cranium Inc. to receive a free replacement die. For additional information, contact Cranium Inc. at (877) 272-6486 between 6 a.m. and 6 p.m. PT, Monday through Friday or visit their Web site at www.cranium.com.